A unique instrument/control surface where you can learn every Major/Minor chord in 2 minutes. 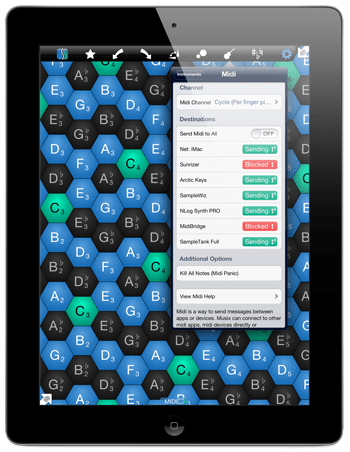 The hexagon note layout allows songwriters to discover new melodies and musical relations, as well, novices find it easy to learn and play. If you want more sounds than the built in instruments, Musix Pro offers Midi and OSC out to control anything you want. the Isomorphic Musical Instrument today on the App Store! You cannot record audio, add effects, or do looping in Musix Pro. That is why Audiobus exists! Musix Pro is key agnostic, which means is that once you have learned a musical pattern (like a chord or a scale) that pattern is the same for all keys, even the dreaded A-Flat! Sharps and flats appear in the right place automatically, through the mathematical magic of isomorphism. You can learn to play melodies on a traditional keyboard by playing them on Musix Pro and watching where the sharps and flats go. Songwriters benefit by discovering new melodies and musical relationships. Novices find it easy to learn to play. Experienced musicians are rewarded with an intuitive interface. Keys can be resized to fit your style - start with "epic"-sized keys, and as you get better you can shrink the keys fill the screen with notes. Isomorphic keyboards are found on traditional and new instruments, from concertinas, accordions, and "jammers" to Janko keyboards, harmonic-table devices and more. 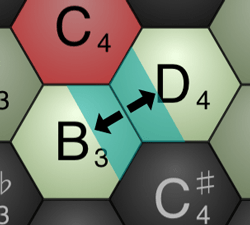 Musix Pro is the only way to access all isomorphic note arrangements in one powerful customizable application. Musix Pro comes with a set of built-in layouts, each with its own pros and cons. 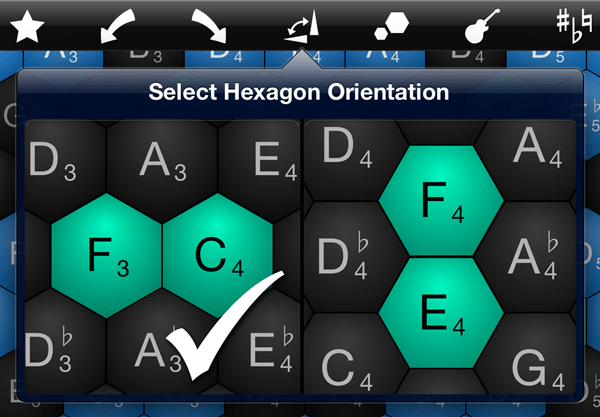 The harmonic table layout allows you to play any major chord by touching three hexes with one finger. Wicki-Hayden makes modulating between pentatonic scales a breeze. Try them all and find one that works for you. 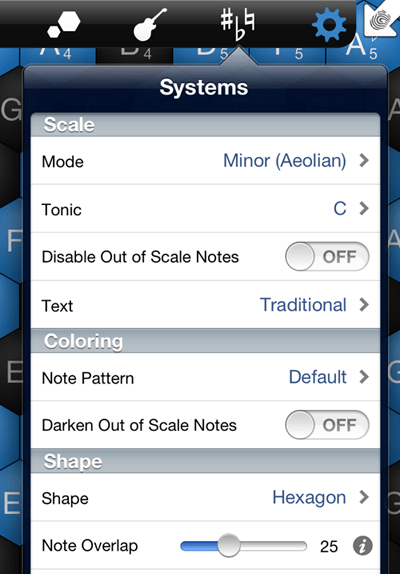 Musix Pro allows you to change the colour of the notes in your layout. You can colour the notes white and black like a piano; you can colour the notes of any scale or mode (like D-flat mixolidian) and you can colour notes based on tone centre. Notes can be labeled with movable or fixed solfege or with the traditional note name (spelled based on the key and mode). Musix Pro comes bundled with a set of pre-fab layouts which includes several of the more popular isomorphic layouts as well as two we designed as part of the development of the app. In addition, we are including more layouts at no extra cost, but we are not providing detailed pattern sets for those keyboards. Each layout has its strengths and weaknesses, and we encourage you to try them all and find one that works for you. Gerhard (- Maj. 3rd; + Min. 3rd; Vertical) Designed specifically for the iPhone/iPad and Musix Pro, this layout attempts to balance the advantages and disadvantages of other layouts listed below. Scales are tight and chords fit naturally on the fingers. Park (- Min. 3rd; + Maj. 2nd; Horizontal) A variation on the Wicki-Hayden (listed below), this layout, white notes are together making patterns easier to see, and scales can be played by sliding fingers along the screen. Alternate and jazz chords are compact, which means this pattern sounds great when button mashing. Wicki-Hayden (- Perf. 4th; - Perf 5th; Horizontal) This is the classic layout used for centuries on Accordions and Concertinas. White notes are together, and the I-IV-V pattern of many many songs forms a compact triangle. Scales play linearly left-to-right (like a piano) with jumps for each semitone. Whole-tine scales are linear. Simple chords are comfortable, more complex chords are more challenging. This is also the preferred layout for "jammer" instruments. 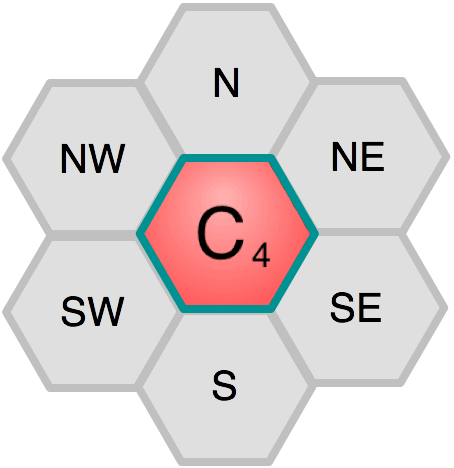 Harmonic (- Maj. 3rd; - Min 3rd; Horizontal) Also called the Harmonic Table, this relatively modern layout was developed and popularized by C-Thru Music, the makers of the excellent Axis line of isomorphic MIDI keyboards. 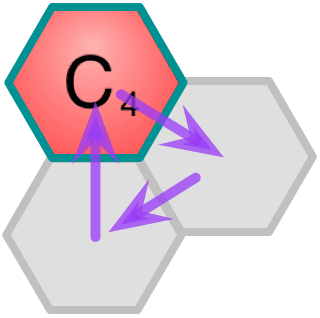 The harmonic table provides impossibly easy chords, with major and minor triads in triangles playable with a single finger. Scales are somewhat cumbersome, but as with all layouts, once learned in one key, all other keys are the same pattern. The note overlap attribute describes the overlap area on a key in which the neighbouring key can be played simultaneously with one touch. A low overlap value will result in a small overlapping area. Likewise a high overlap value will result in a larger overlapping area. Each sound is created from scratch using FM-Synthesis or Wave-Synthesis. This allows the creation of complex harmonic spectra or in other words, full and rich sound. To roll your own layout, Choose an interval for each direction (South-East and South-West) and choose Horizontal or Vertical Layout. Left-to-right: South-west interval, South-east interval, Orientation. You can also choose the note size. So while it looks like you can define six intervals, one for each direction, three of the directions are constrained to be the opposite interval of the opposing direction, and thus can't be defined. But if you look a little deeper, you can only define two intervals. For example, in the Harmonic layout, the south-east direction is a descending minor third (3 semitones), and the south-west direction is a descending major third (4 semitones). the sum of these intervals is seven semitones (a fifth), so the north direction (the third leg in the triangle) must be an ascending fifth. In Musix Pro, you can define the interval for the south-east direction and the south-west direction, and all other intervals will be calculated and filled in. 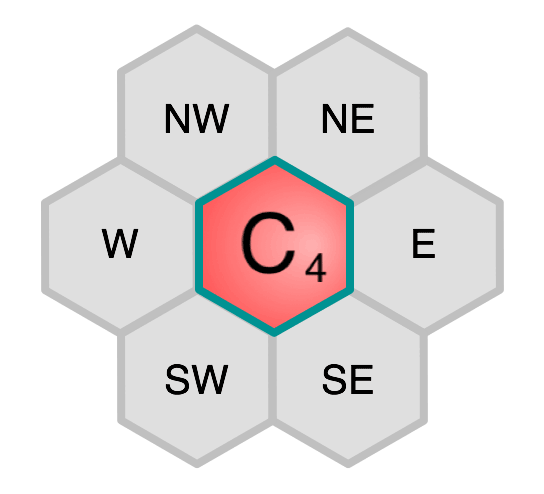 For example, for the wicki-hayden layout, south-east is a descending perfect fourth, and south-west is a descending perfect fifth. One more feature to choose is whether the layout is horizontal or vertical. horizontal layouts have an east-west direction but no north-south direction, and vertical layouts have a north-south direction but no east-west direction.